Frustules are rectangular in girdle view. Valves are flat, linear to linear-lanceolate, with wedge-shaped ends. Apices are beak-like, rounded, and somewhat rostrate. The raphe is positioned at the valve margin. A conopeum is visible sometimes in LM. Striae are visible in large specimens. 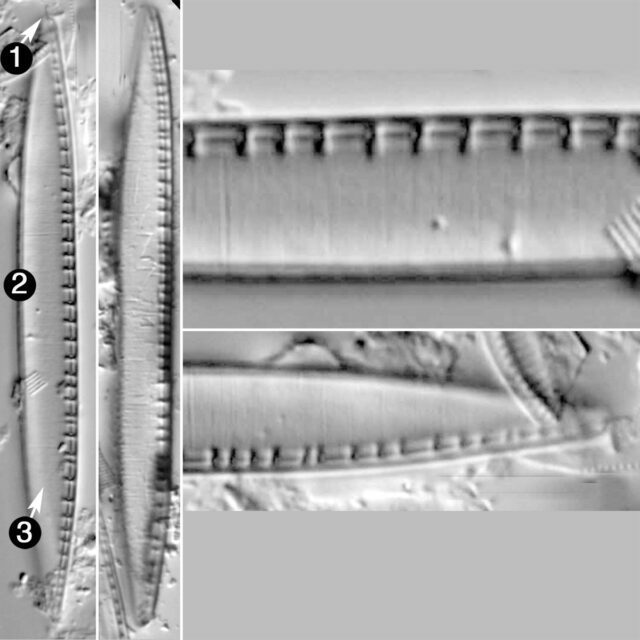 Fibulae are long (1-2 µm) and irregularly spaced, 6-8 in 10 µm. Valves are linear to linear-lanceolate with beak-like apices. Valve length is greater than 40 µm. Valve ends are rostrate. Striae are fine and may be visible in LM only in larger specimens. Fibulae are perpendicular to the margin and irregularly spaced.